So one of the biggest questions I get asked after giving a session on beacon technology is ‘where do I get beacons?’ Google is your friend in this regard, with tons of new hardware vendors rolling out new beacon brands. I really like the Gimbals though as a starter bit of kit. Why? FREE? Yes, free. For the time being, Gimbal will ship new eligible developers 3 of their Series 10 beacons for free. Simply visit http://manager.gimbal.com and register for an account. Once confirmed, sign in, you should a new store link near the bottom of the left hand menu. You may have to create an account for the store, I know that we had to, but we also were early adopters, so maybe our old account hadn’t been imported into the store. Either way, in the store you will find the ‘3 Pack Promo’. If you are eligible, add if to you cart, and place the order. Sit back and wait for a confirmation email, a tracking number email, and then the package. Unless you are Dan in Spain, they should arrive within a week. So your box has arrived, and you want to play with these new magical toys! To help in managing your new Gimbals, you will need to download the Gimbal Beacon Manager from the App Store on a beacon compatible device with a beacon compatible iOS version. Once installed, you will be prompted to log in to the app with your Gimbal credentials. The Gimbals ship with a piece of plastic between the battery and the connector. This is great because, unlike estimotes, these things aren’t wasting battery power during shipping. The plastic strip is also not designed to be just pulled out. This is by design. You will need to take a coin and open up each of your new beacons. Each Gimbal has a unique hardware id. See? You have to open the device to get the id. Thats why you couldn’t just rip that piece of plastic out! So, now it is time to program your Gimbals. 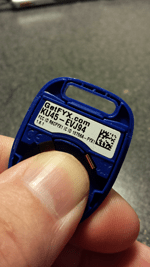 The Gimbal Beacon Manager fetches profiles and firmware from the Gimbal portal and applies them to the device. So, we will need to register our new gimbals in the Gimbal portal. This will associate these devices with your account. Log in to the portal, select Proximity and then Beacons on the left hand menu, then choose Activate Beacon from the buttons (or drop down) in the upper right hand corner. A quick tip regarding your beacons. For now I suggest placing small dots to indicate which beacon is which on the back of your new toys. This makes it a lot easier to identify them while playing with different scenarios. As you can see i this account, we have named them ‘Test Beacon’ and given each a number. That corrosponds to the number of dots on the back of each one. Don’t place the dots on the face plates, as those can get mixed up. 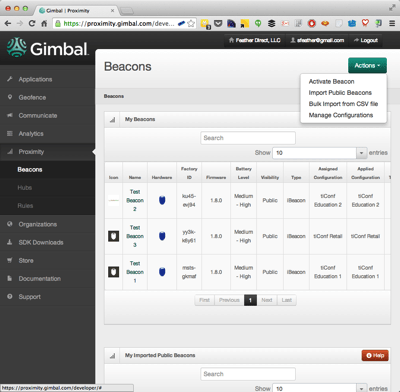 Your new beacons will be assigned, by default, a gimbal managed profile. You will need to create an iBeacon compatible profile for your beacons and push that profile to them using the iOS beacon manager app. With your beacons registered, you can open up the iOS app. Confirm enabling all the BLE settings when asked by iOS. In the sliding drawer of the app, choose Configure. Now place a battery into one of your beacons. Because you will be popping the battery out again in a bit, you may want to just press it in firmly for now instead of popping the back onto the beacon. When a battery is first inserted, the Gimbal is programmable. When the app sees the beacon, go ahead and select update firmware. This will bring your beacon up to the latest available firmware (1.8.0 as of this writing). Depending on radio strength, this may take a bit. Then apply a profile to the beacon. The app will query the portal, pull down the profile assigned to the hardware, and save it to the beacon. Once done, you can go ahead and do the same for your other two beacons. So you now have 3 beacons registered to your account. Now, don’t get me wrong here, the Gimbal SDK for iOS is well documented right now. You can require user registration before an app interacts with your beacons, can pull the gps coords you assigned to your beacons down and use that to give you some locations. Tons of things you can do. But in their current state, they are not iBeacon compatible. We are then going to Add New Configuration. Give your profile a name, from the drop down select iBeacon. Now, you will have and to decide what your projects architecture will be as you must now assign your beacons UUIDs, along with major and minor numbers. This is a discussion for another post. If you are so inclined, you can also mess around with Transmission Power. 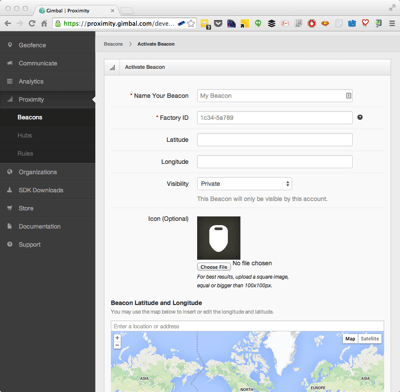 If you will be working with your beacons day in and day out, leave the defaults alone. If you are only working with your beacons at your desk, you could reduce the power to conserve battery life. However, this affects range, and also the accuracy of ranging. Decisions, Decisions. Create Configuration to save. You can now go back to your list of beacons and assign the new profile to them. You will need to pop out your batteries and reinsert to put the beacons back into programmable mode, run through the process from above in the Gimbal Manager App to push the new profiles to the devices. There is a bit of a pain point. You cannot adjust a profile while it is assigned to a beacon in the portal. That means to adjust radio power, you need to change the assignment for the beacon to a different profile, adjust the settings in the profile, then reassign the profile back to the beacon, pop the batteries, and push the profile to the hardware. Just an FYI. Cost is a big deal, particularly when you are planning to roll out a bunch of beacons. The series 10 beacons are $5 each in packs of 3. That is a terrific price for FCC certified hardware that you can place into service within the United States immediately. Our application to join the developer program included use cases that were NOT in the retail space. This got the attention of someone in sales, and that started a chain of telephone conversations with both sales and marketing at Gimbal. Great folks. Because we were early adopters, we had some questions that were not addressed in the documentation. We have talked to support twice so far and have had a great experience both times. Thanks for your clear walkthrough. Everything looks great, but… the Gimbals do NOT seem to show up as iBeacons. Is this actually true? Or do your Gimbals function as iBeacon correctly on your iOS device? My series 10 beacons, with a properly applied profile, operate as ibeacons. Once an ibeacon profile is properly applied to the series 10, in the gimbal manager app, you will see each beacon 2x. Once as a gimbal, and a second reference as an ibeacon with the major, minor, uuids. I’ve used them in native objective-c and with ti.beacons in Titanium. It did work, I needed a res of my iPhone (suggested by the fact that my previously working Estimotes did not show up either). I do see the double entries now. All is good: Thnx! Have only run into it once in our months of testing, but others seem to hit it more often. Also, regarding region monitoring in the background, it seems as though ble core location stuff is like the last service to start on device bootup, which can be annoying in testing. This was a great help! I got my Gimbals up and working at proximity beacons right away after the firmware upgrade. The application I’m working on needs to recognize the beacon in less than a second of power up. The Gimbals take a consistent 5 seconds to be seen. Other iBeacons are seen instantaneously. Does anyone know if there is there a configuration setting I can make to get this time down? 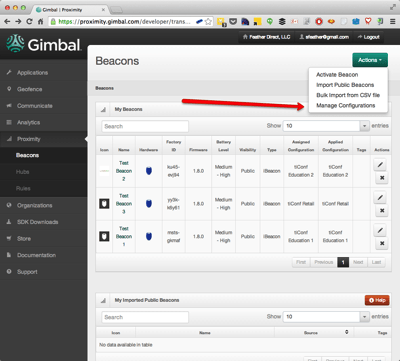 In the gimbal portal, when building the Ibeacons profile, you can set the power and the frequency. Increasing either increases battery usages, power increases distance, frequency increase should reduce time to be seen. Q1: From what I read, it seams that only the “series 20” Gimbals can be used as iBeacons, is this true? I did apply iBeacon configuration to my series 10, and I can see two beacons in the Beacon Manager app. But I can’t discover the beacon in any other app (including estimote’s). Is there an way to make them discoverable to existing apps? Update: I can see the S10 in AirLocate now. Update: I succesfully got a Gimbal talking to Launch Center Pro now. @moderator you can remove all of my comments, my question is answered. Most beacons have a manufacturer provided app or sdk that handles device management. 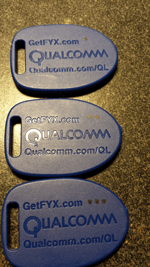 In answer to your question, YES, it is time consuming to configure dozens+ of beacons. I just received my Gimbal Beacon. As good as this post is I am still having issues getting it set up. Is there any additional online information or video on how to set one of these up? I am not a developer so I need it in layman terms.